I recently watched an ABC special titled, Michael J. Fox: Adventures of an Incurable Optimist. I watched because I was intrigued after I read an article about how Fox (diagnosed with Parkinson’s disease 18 years ago) has become a major patient advocate for the disease, all while remaining an optimist about what the future holds for him. In this special he offers his philosophy on dealing with the disease and also interviews a number of people about the concept of optimism. As a patient, I’m always very interested in learning how others cope with a chronic problem. As a person, I’m intrigued by what makes people tick. There were a lot of quotes from the one-our episode that I found thought-provoking and inspiring, so I decided to highlight them in a handy little blog post so that we could all be inspired. The only unavailable choice was whether or not to have Parkinson’s, everything else was up to me. I could concentrate on the loss or I could just get on with my life and see if those holes starting filling in themselves. For everything this disease has taken, something with greater value has been given, sometimes just a marker that points me in a different direction that I might not have otherwise traveled. What i find is that it’s important that if I am going for that goal or if I am going for that thing, is that every moment I am short of that, isn’t a bad moment because I’m not there yet. It’s okay to just be striving. Do the next right thing and hopefully something will happen. I think that’s where the hope comes from. If I could do everything then I have no reason for hope. And there’s something in the hope that’s even more powerful than the realization of whatever the hope is for. You are most optimistic when you feel you are not alone. Music is, to me, the soundtrack to optimism. Silent optimism is optimism at eight, when it could be at ten. The quote that I found most interesting was: “Do the next right thing and hopefully something will happen.” I’m often so worried about “doing things right” that sometimes I lose sight of whose “right” I’m trying to live up to. Usually, it’s some sort of “rule” that I’ve created in my head that only makes life harder for me. The “next right thing” sounds much more achievable and spiritual. It sounds like something I just need to be open to, not something I have to agonize over for an entire day, then make a decision about, then worry about whether or not I made the right decision. Watch the entire special here. 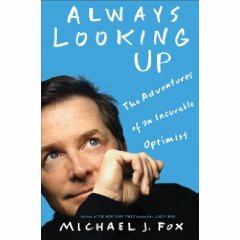 And I’d be remiss if I didn’t mention that this TV special was also created to help promote his new book, Always Looking Up: The Adventures of an Incurable Optimist. What are your tips for remaining optimistic in the face of chronic disease? What a beautiful post and thanks for adding the link to the show. I am going to watch it this morning. My optimism comes from those around me. I have been fortunate to surround myself with family and friends who believe RA is in my life for the short run. Like Michael J. Foxx, so many wonderful things have come from this experience. I am a lucky girl. I watched this show as well. I love Michael J Fox’s attitude about his disease. I blog about RA as well. I try every day to focus on the good things in my life and not on what has been lost because of this disease. Thanks for sharing this!